2credit: Break up to 3 barrier subroutines. Breach is an astoundingly good Barrier breaker, lagging only 0.10 behind Corroder when comparing average costs. 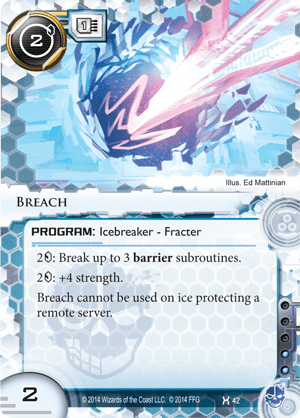 In fact, Breach defeats many commonly seen Barriers even cheaper than Corroder, usually by more than 1, while breaking even with other common ICE. Notable ties include Eli 1.0(4 vs. 4), thought you will find yourself paying another for Wraparound and Ice Wall. For Criminals looking to focus their eyes on centrals, saving an influence on a second Corroder, and/or looking for some Blue Sun hate, Breach can be considered cool enough to be in the same room as Passport, while Alias weeps in the dumpster out back.